The temperatures outside are now officially fall-like (yay! ), which means that it is totally appropriate to bring out all the apple-, pumpkin-, and spice-flavored baked goods that go into hiding the other 8 months out of the year. Fall is definitely my favorite season for food (anyone else?). To honor the descent of the temperature into the low-60s, I want to share with you a pancake recipe that I tried out a week ago (when it was still 80 degrees outside). You all know my love of banana nut muffins (I’ve made them twice on the blog), so when I had some overripe bananas and the hankering for a spice-flavored breakfast item, inspiration struck. And Banana Walnut Pancakes were born! The pancakes start with my regular ‘ole pancake batter. First, assemble the dry ingredients in a big bowl. 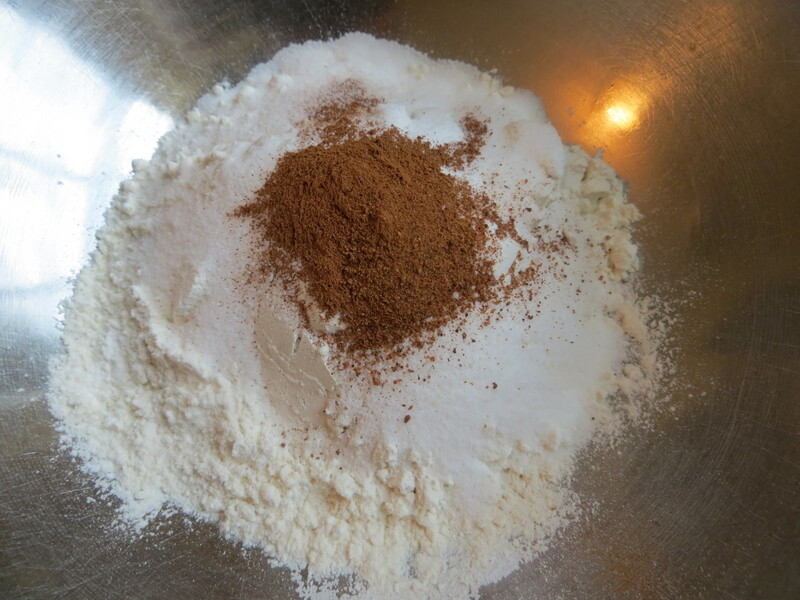 Flour, sugar, baking powder, salt, cinnamon, and nutmeg all get added and then thoroughly whisked together. And perfumes the kitchen with the smell of fall! … and then poured over the dry ingredients. Gently mix the wet into the dry until just combined. Please don’t overmix your pancake batter – it will never forgive you! The last two additions to the batter are two overripe bananas that have been thoroughly mashed and some delicious flavorings. You also know that I think whiskey and bananas are a great combo, so I added in some whiskey to the batter along with some vanilla. If you don’t like cooking with alcohol, you can leave it out! I set a pancake griddle over medium-low heat and sprayed it with cooking spray. Then sprinkle on some finely chopped walnuts. I love walnuts in my banana nut muffins, but pecans work here too! When the pancake starts to bubble, flip them over. Allow the pancakes to cook for an additional minute on the other side. And then they’re done! I usually pop the cooked pancakes onto a wire baking rack set in a 185 degree oven. The pancakes stay warm, but don’t dry out. Serve them up with your favorite pancake syrup! 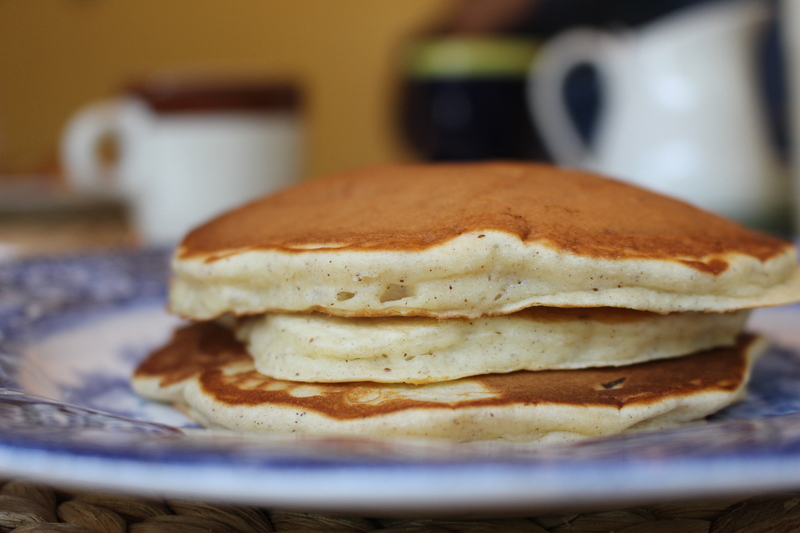 I hope you enjoy this pancake recipe that will warm you up on a chilly fall morning! 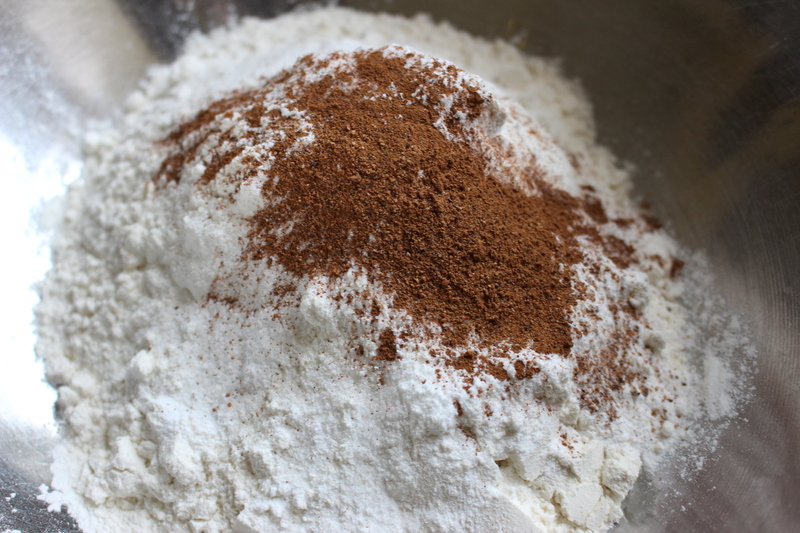 In a large bowl, combine flour, sugar, baking powder, salt, cinnamon, and nutmeg. Whisk to combine. In a small bowl, combine eggs and milk. Whisk to combine. Grease preheated pancake griddle with cooking spray. Ladle batter onto the griddle in ¼ cup measures. Sprinkle chopped walnuts over each pancake. Add chocolate chips if desired. When the pancake begins to bubble, flip over and cook for an additional minute until the underside is golden brown. Store cooked pancakes on a wire rack and place rack into the preheated oven. Serve the pancakes with warm syrup. Things have finally settled down around here after a big weekend of celebrating E’s birthday… I think she had a nice time having a celebration in her new place with her new friends and a celebration at home with her family. Best of both worlds! Being the birthday girl meant that she got to choose all the foods for each meal on Monday – our favorite burger joint for lunch and our favorite Mexican place for dinner. What was left was breakfast… and what E asked for surprised me. E loves eggs and I assumed that she would want baked eggs and scones for breakfast. She threw me for a loop when she requested Belgian waffles… but the birthday girl gets what she wants (plus, who does not love a good waffle?). Belgian waffles are super easy to make but do require some steps. They start with two eggs that are separated, with the whites going into a small bowl and the yolks in a large one. Beat the egg whites with a hand mixer (or by hand if you want to work out your muscles!) until soft peaks form. Set aside. Add in some milk and vegetable oil. Whisk to combine thoroughly. Then add in some flour, sugar, baking powder, and salt. Stir gently to combine, but don’t worry if there is a lump or two. Then add in the beaten egg whites. And gently fold them into the batter – if you mix too vigorously, the egg whites will deflate and your waffles will lose their light texture (and you will be very, very sad… trust me). Portion out the batter into your pre-heated waffle iron and cook using the appliance directions. For my waffle iron, I portion out 1 cup of batter in the center of the iron and allow the weight of the lid to push out the batter evenly. The amount you need for each waffle can vary depending on the size and shape of your iron – I have a large waffle iron that makes 4-4” inch Belgian waffles. To keep the waffles warm, I keep them on a wire cooling rack in a 185 degree oven. Then just serve them up with your favorite toppings – we went with a selection of fresh berries and a dusting of powdered sugar but the options are endless. PB&J, chocolate hazelnut spread, chocolate chips, Greek yogurt and honey, fresh strawberry sauce, chicken tenders (chicken and waffles… food nirvana), plain ole maple syrup, etc etc etc. A sweet birthday breakfast for an even sweeter sister! Have a great week, kiddos! Preheat your waffle iron according to the manufacture’s instructions. Separate the eggs, placing the egg whites in a small bowl and the egg yolks into a large bowl. 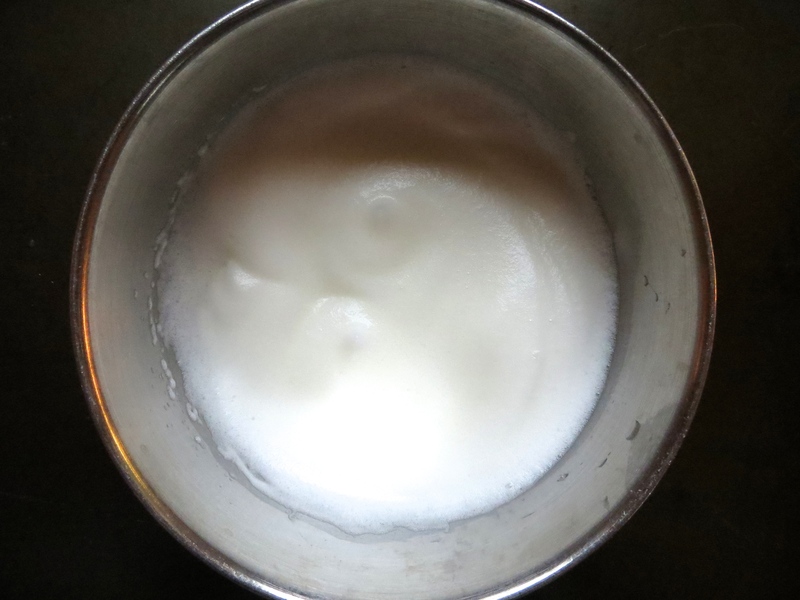 Whip the egg whites until they form soft peaks, about 1-2 minutes. Set them aside. In the large bowl with the egg whites, add in the milk and oil. Beat until thoroughly combined. Add in the flour, sugar, baking powder, and salt. Gently stir to combine – don’t over mix (a few small lumps are okay!). Add the beaten egg whites to the batter and gently fold to combine, leaving some patches of egg white. Grease your preheated waffle iron with some cooking spray. Portion out the batter into your waffle iron according to the manufacture’s directions – make sure you cook until golden brown and crisp! Serve with your favorite toppings (the possibilities are endless!). There is nothing more that I love in life than a perfect, relaxing morning. Last Sunday, I was able to enjoy one of those mornings. A five-mile run, a leisurely trip to the farmer’s market, and French toast. But not any French toast. I love French toast. It is delicious, impressive looking, but cooks fairly quickly with no fuss. If you have impromptu sleep-over guests, then French toast is a quick hot breakfast option that allows you to enjoy spending time with your guests (and sleep in a little). 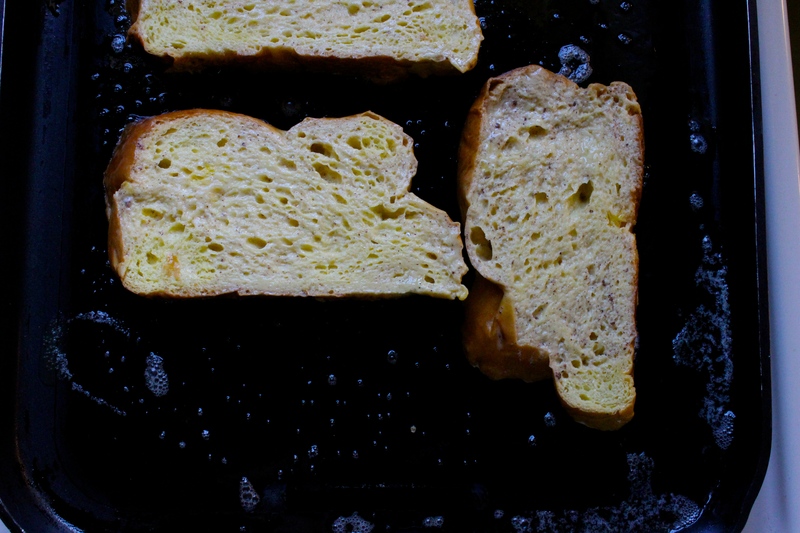 As much as I love sandwich bread French toast, challah bread elevates it to a whole other level. 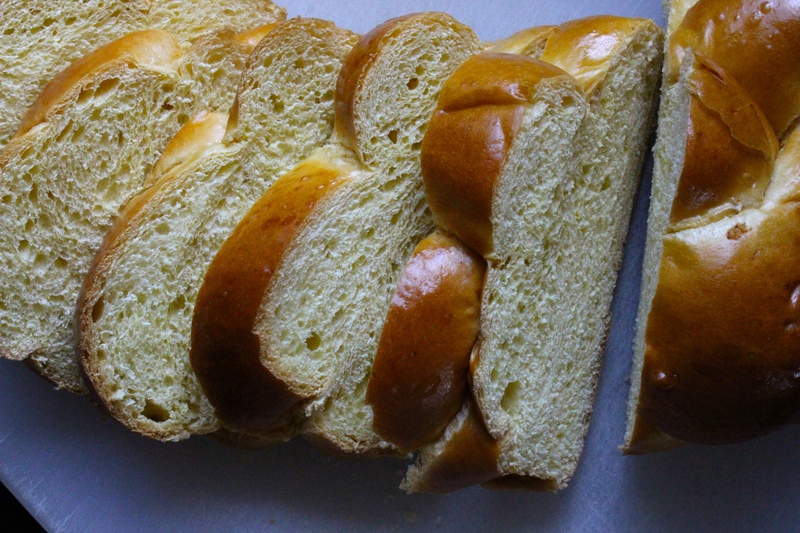 This egg-based bread is commonly sold in the grocery store and can be identified by itself distinctive braided style. This is the one I picked up at the grocery store… those knobs are French toast perfection! 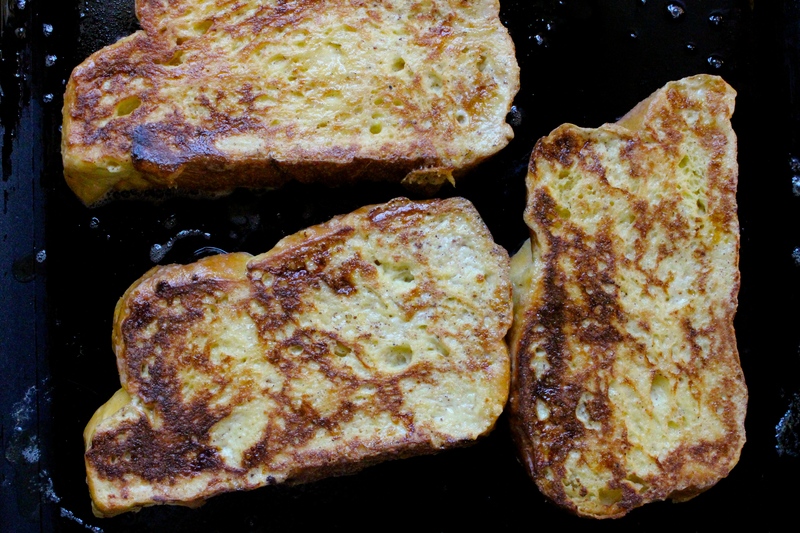 It seems simple but this mixture will give the french toast great flavor! Then grab your challah bread. Place the challah bread into the baking dish with the egg mixture. Using a fork, pierce the surface of the bread so the egg mixture can completely soak through the bread. Let the bread hang out in the mixture while you heat up your skillet. My family broke out the big guns and we used our pancake griddle! To which we added some butter (or you can use non-stick cooking spray). And then the French toast gets placed onto the griddle. I usually cook my French toast on medium-low heat. Since the challah bread is cut relatively thickly ( ½ to ¾ inch thick pieces), I want to make sure the middle cooks through before the edges burn. It takes a little longer, but it is totally worth it. I usually start taking a peek at the bottom of the French toast after 2 minutes. And flip over when it becomes delightfully golden brown. 1. 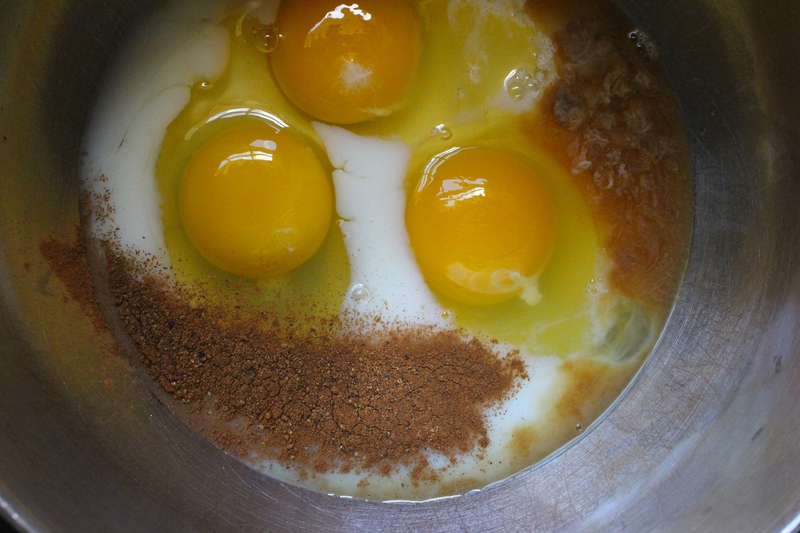 In a bowl, combine eggs, milk, cinnamon, nutmeg, and vanilla. Pour into a deep-sided dish. 2. 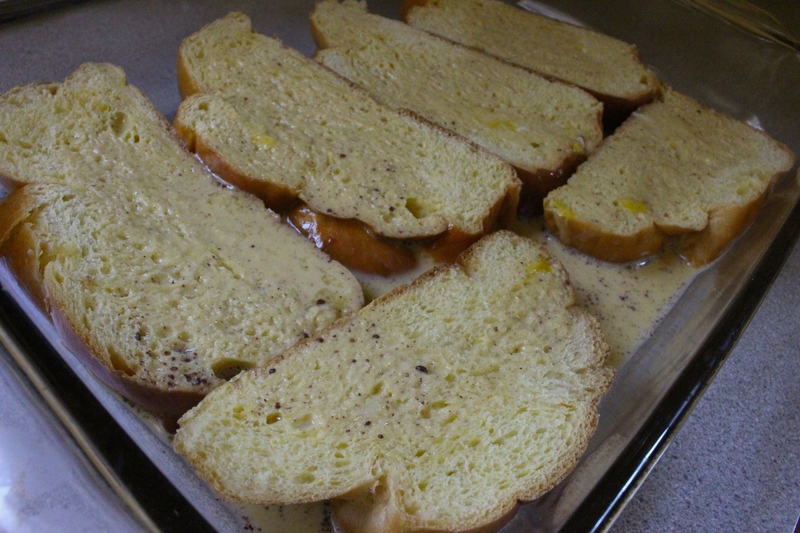 Place the slices of challah bread in the egg mixture, piercing both sides of the bread with a fork. Let slices sit in the egg mixture until it’s time to cook. 3. Heat a skillet or griddle over medium-low heat. When hot, spread with butter or spray with non-stick cooking spray. 4. Place soaked bread slices on griddle and cook until side is golden brown, about 2-4 minutes. Start checking on the French toast after 2 minutes. 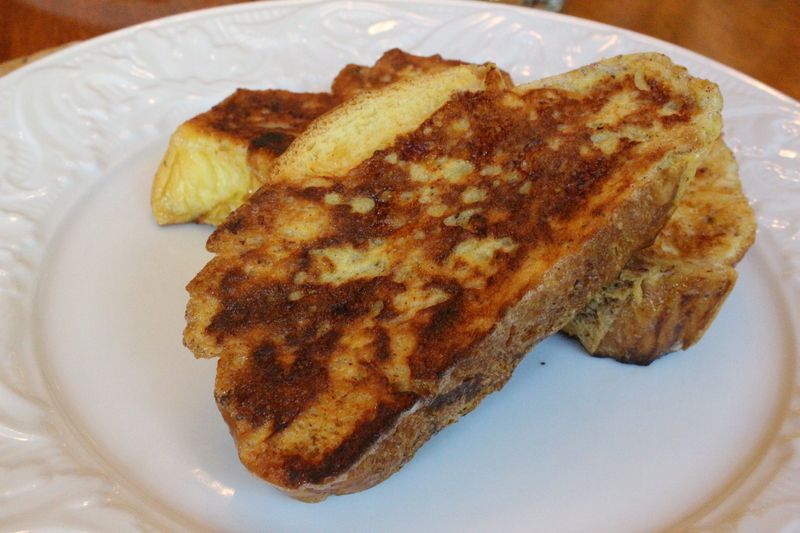 Flip the French toast when it is golden brown and cook for an additional 1-4 minutes, until the reverse side is golden brown. 5. Serve immediately with butter, syrup, fruit, or jam.